Alpacka Packrafts. Pristine. Personal. Alaska By River. A Gorgeous, Wild Float Trip. Packrafting is possibly one of the most interesting and most Alaskan of backcountry trips. The serene Alatna River passes through some of the wildest and gorgeous country in Alaska. Meandering through the heart of the Brooks Mountain Range, this journey is a wonderful way to visit this land. For this trip we travel from Fairbanks to Bettles, Alaska. Here we make a brief stop, switch to a float plane, regather and then depart for the park. Fly in to the park and land on the upper Alatna River. We have a couple of options regarding the drop-off. That’ll also be determined by the trip length we schedule. It takes a while to rig up and to learn to rig up the packrafts with your gear so we’ll send some time doing that, getting organized before making camp. We’ll also spend some time in the water practicing and learning the fundamentals of packrafting technique and basic river safety. Ready to go? We’ll break camp and set out downriver. This is a fun, easy float down Class I water. There are campsites at every bend of the great meandering river so our schedule is as loose and fluid as it needs to be. We’ll make our way overnight down river and end up at the take out. Here we meet our bush pilot and air taxi service for the flight back to Bettles. Keep your camera handy for what is a stunning flight. Overnight in the Bettles Lodge and return to Fairbanks the final day. Trip Highlights The Brooks Range, packrafting, mountain scenery and true wilderness. Trip Options We can sort up near the headwaters for a longer journey or midway down river for a shorter option. The trip can also be combined with the Arrigetch Peaks Backpacking Trip. The perfect finish to your Arrigetch Peaks backpacking trip. The Alatna River packrafting option adds 2-4 days to the hike. The two day option is the most popular, and a nice intro to packrafting for those who’ve never traveled this way before. 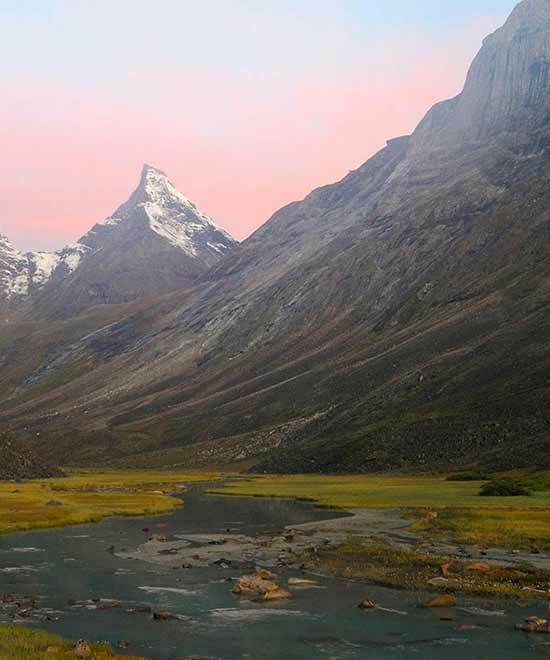 Gates of the Arctic National Park offers some extraordinary backpacking opportunities, but hiking is also a challenging way to travel in this country. Muskeg, and brushy, trailless terrain aren’t easy walking. For the newbie here, you’ll be surprised just how hard some of that very inviting landscape is to walk across.If you would like to packraft the Alatna from its headwater near the Continental Divide, we can run that trip separately from the Arrigetch Peaks hike. Inquire for details. Rivers have historically been the highway of the Alaskan wilderness. During winter travel they offer an open, brush free frozen route to ski, snowshoe or snow machine along. In summertime, Alaskan rivers become an ever better option. Canoes and rafts were long favored by early European explorers in Alaska. Today, the packraft is the vessel of choice. Small, portable and light, they’re easy enough to roll and carry on even multiway portages. Versatile and flexible enough to handle even serious whitewater, they also excel on simple flatwater float, such as this stretch of the Alatna River. Do I need packrafting experience for this trip? In fact I recommend this trip as a great option for those folks with zero packrafting experience. Expeditions Alaska will include all your packrafting gear. If you have your own boat you’re welcome to use it. But dry bags, dry tops and dry pants, PFDs, paddles and packrafts are all included. You’ll need your own personal clothing, base layer items, any hiking clothes, etc. That’s up to you. We can include your tent and all the food, cookware etc as you prefer or do it yourself. Are there dayhiking options available? Sure. Depends how much time you want to take. But we can add in a day, or two, or three, and do some hiking along the way. The Alatna River valley is a great wide forested floor for endless wanderings. Or if you’re up for it, we’ll climb some of the nearby ridges and get a view from high. I recommend folks do the Arrigetch Peaks backpacking trip then finish up back at the Alatna River and packraft from there. We can also packraft first. Start further upriver and packraft down to Arrigetch Creek, stash the boats and then backpack up to the high country. Can be, for sure. Early summer is worse. My preference is August/Sept. Fewer bugs, and great fall colors. Bring a headnet and repellent. Do we see much wildlife? There are quite a few bears along the Alatna, both black bears and grizzly bears. I’ve seen some most trips. Also moose. I’ve heard wolves howling at night and seen otter in the river as well. I know you do. I do too. You should contact me via email or call me at 1 (770) 952 – 4549. Class IV water. World Class Packrafting. Remote. Rugged. Rewind. On a scale of 1 – 5, five being the most challenging, four hiking boots is toward the tougher end of the course. Expect whatever level you think might best fit you to be one level LOWER on our scale. Hiking here in Alaska is generally a step or three above what you’ll find in the Lower 48 states. We might call something intermediate-advanced, and it may well be the toughest trip you’ve ever done in your life. Just understand that these metrics aren’t perfect. You’ll find some good, easier walking, but also encounter sidehill or moraine and talus, or dense brush such as alder or willow. The challenges aren’t generally so much in the distance we cover, or the elevation gain and loss. Most backpackers are surprised just how far we do NOT go on a backpacking trip in Alaska. The challenges are in the terrain you’re walking over, and how well you adapt to those. Some people do great walking on boulders, and other people struggle to the very last stone. I can’t tell you how well you’ll do on a specific route, but we’ll do our best to work with you to match you with a trip that fits your experience and backpacking level. Most people will call these trips tough. They just haven’t done the 5 hiking boot trips. An exceptional Alaska whitewater packraft trip. Not for the meek or inexperienced paddler. A great extension/Add on for the Sanford Plateau hike. 10-12 days in the Brooks Range. We float the Continental Divide to the Arctic Ocean. Hiking, camping, rafting, wildlife photography and exploring one of America's finest wilderness.